Our Gel-Seal T-Grid is a state-of-the-art system offering significant advantages for maintaining tight-tolerances in higher class cleanroom environments. The gel forms a secure, airtight barrier against dust and moisture for sensitive cleanroom requirements. Sprinkler Penetration Sleeves, Ionization Emitters and seismic sway control can be incorporated into the system. Consult with our factory for more information. Urethane Gel: Call the factory for specific information. 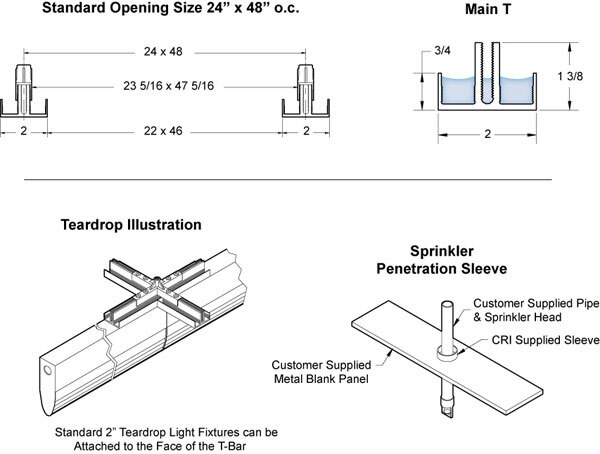 Connectors are designed to accommodate standard 2’ x 4’ openings as well as unusual configurations. The zinc castings are designed with an integral 3/8” x 3/4” high threaded tower providing a strong load bearing capability. The tower accepts our 3/8” #148038 Right Hand/Left Hand stud which is connected to a #148039 threaded turnbuckle. A preferred method of suspension from the building structure is all-thread rod attached to the turnbuckles as illustrated. 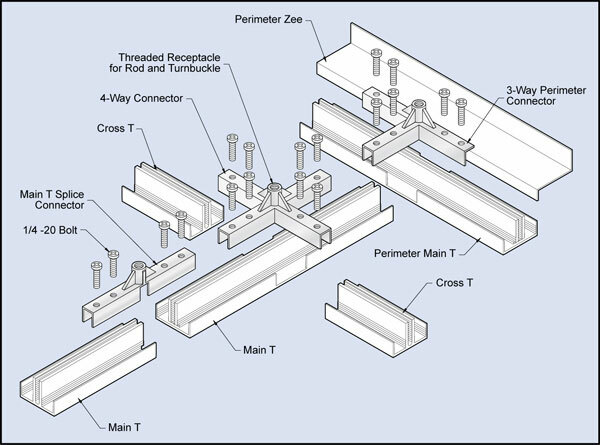 For applications in seismic zones, the all-thread rod serves as a compression strut . Seismic sway is controlled by attaching splay wires to eye bolts secured to the Intersection Connectors. 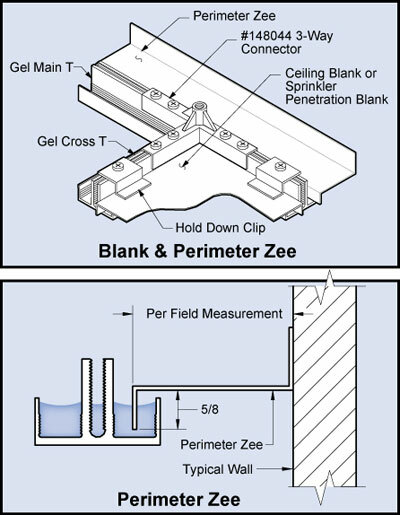 Our exclusive Perimeter Zee serves as a closure trim piece between the wall and adjacent T-Bar, resulting in properly sized openings for installing SAM units, lights or metal ceiling panels.